Today was incredible and many had tears throughout the day. From a boat ride on Galilee to Mass at Capernaum; from the ascent into Jerusalem to going down into the tomb. It was a marvelous day! The sea was calm and the boat ride smooth. No waves to cause fear and no one dared walk on the water. All of our faith must have been too small :-) But it was a great voyage to Capernaum for Mass. Along the way I told the story of my night fishing with Jewish fishermen on the Sea of Galilee. The nice ride up to Jerusalem was broken up by a stop for restrooms, coffee and ice cream. Fr. Bill told his vocation story and I told my conversion story. We arrived in Jerusalem just in time for a potty break and off we walked from our Notre Dame Hotel to the Church of the Holy Sepulchre. I had arranged a Solemn Entry for your group. All the crowds had to step aside as the Franciscans escorted us in with organ music, Latin singing and great pomp and circumstance into the Church. After the Provincial gave us a rousing welcome we all entered the tomb 4 by 4 to witness for ourselves that the Tomb is still empty. Not a few came out with tears streaming down their cheeks. Dinner at Notre Dame and a lot of discussion and friendship ended a marvelous day. Tomorrow we spend the whole day in Bethlehem. 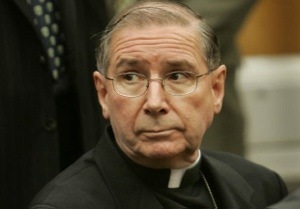 “Los Angeles Archbishop Jose Gomez on Thursday announced dramatic actions in response to the priest abuse scandal, saying that Cardinal Roger Mahony would no longer perform public duties in the church and that Santa Barbara Bishop Thomas J. Curry has stepped down.